We bring snowboarding and other events and people right to you!. The buttons on the left are the "TV Shows." The individual videos are the "TV episodes." It's easy, it's fun. It's new! We're always here for you to enjoy. 3rd Rail Jam by Under Armour made its 2nd stop of the 8 stop 2011 tour at Mountain Creek, Vernon, NJ on January 8 2011. 150 snowboarders and skiers entered this event which lasted for an unprecedented 4 hours of action and fun on the urban style rail setup created after intense hours of work by Jiblab and the Mountain Creek Park Crew. Sketchy D makes a cameo appearance on his home turf as a judge of the competition. This video is the short reel, see the longer versions for the full interviews with Top DJ Image of the Bum Squad. Also in the longer version Kevin Whitehead of Outkast Sports in Vernon tells us why the kids flock to this rail jam. Jesse from Jiblab and the Park Crew guys tell us about the rail setup. Meet Danno and his hat hustle along with happy customers of Ugly Hat. Meet: last year's winner and a local favorite Timmy Kempson and his Dad Grover Tim.Tom Weiss gives us a shout ot and a big smile.Meet the Hip Hop artist who has UFO as his a.k.a. and Split Personality, Rail warriors Cam, Chris and Chris all a little worse for wear and banged up from today's action and accidents. Thank goodness Chris Solimini was up and walking after his spectacular crash on the bus shelter that stopped the rail jam and had everyone praying for him and sending good energy. In the longer video he tells us why he thinks the accident happened and how it could have been avoided. Raekwon performs as well as DJ Image, And NYCE and Reckless wrap up the late show. Video by Lauren Traub Teton, exclusive for SnowboardSecrets.TV. Hip Hoppers Sal Good and Poet Jabre del Sol share some inspiration on the consciousness of Hip Hop. Lindsay from Boston tells us to reach for the stars - that's how she ended up with $18 in cold cash that fell from the sky. All this magic happened at the Under Armour 3rd Rail Jam at Killington, Vermont on the auspicious date of 1.1.11. The Superpipe at Bear Mountain, Killington, VT is being built before our eyes. Yesterday it wasn't even a halfpipe, just a little pile of snow. Today on January 2, 2011 the right wall is steep and taking shape. Meanwhile, TWO new coffee places opened 3 weeks ago. 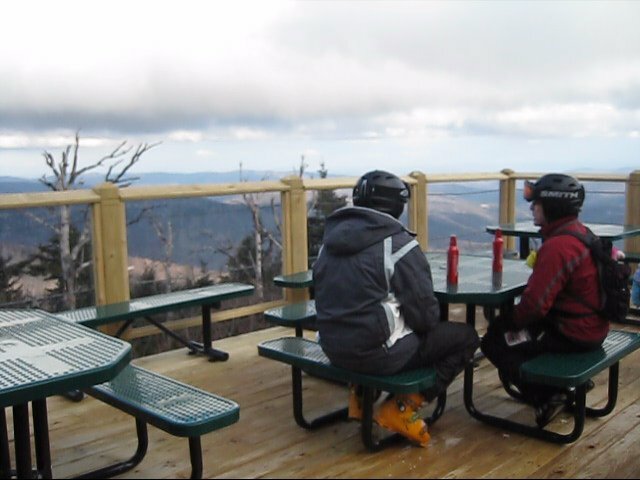 One is the Vista View Deck, trailside on Great Eastern, and the other is Liquid Art on the Killington Road. We predict that both will be big winners! Video by Lauren Traub Teton for SnowboardNEWS.TV. Discounted Snowboard Lift Tickets and Lodging from Mountain Sports Club - Save $10 Here Now! Mountain Sports Club is an online membership subscription that lets members download coupons at ski areas for lift tickets, lodging, lessons, ski shops, and travel offers Over 100 Ski areas nationwide participate in Mountain Sports Club, half price ski tune-ups, restaurant buy one get one half price, and lodging deals, with the number of providers rapidly growing, and new coupons added all year. Also whitewater rafting trips, and golfing in the mountains trips. Packages and lodging deals in resort towns like Steamboat,Breckenridge, Whistler,and Utah. Sports Industry veteran John Siewerski is the mastermind behind the Mountain Sports Club. Then save $10 by signing up here and using the promotion code "secrets." Everything you wanted to know about Flexmeters.com snowboard wrist guards and skateboard wrist guards and snowboard gloves with wrist guards built in. We'll show you what they are, how they work, how to choose your correct size, and model, and more! Flexmeters.com are distributed in the US by SnowboardSecrets.com, a division of Sport Secrets LLC and are made by Docmeter of France. Video by Lauren Traub Teton for RealPeopleMarketing.com.